Welcome to the DCATA Website! If you are not already a member please join us. You will have access to DCATA member information, Per Diem Opportunities, the monthly DCATA News and more! I attended Temple University for both my Bachelors and Masters degree. I was also a graduate assistant with Temple’s Men and Women Track & Field team from 2009-2011. In 2011 I moved to Virginia and shortly after took a job at Friendship Collegiate Academy, where I have created the athletic training program from the ground up. 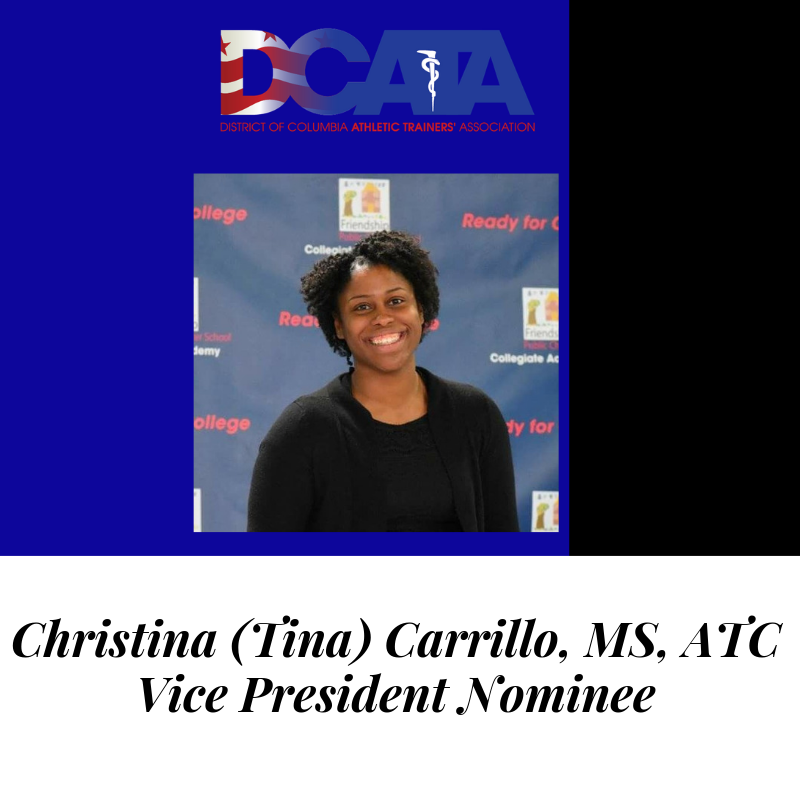 I attended my first DCATA meeting in 2013, and learned of the potential licensure legislation that would hurt the majority of athletic trainers in DC. In an effort to get the word out to other athletic trainers, I created the DCATA website and all of the DCATA’s social media platforms. I still main all of those to this day. In 2014, I became a committee member on the District of Columbia Sports Medicine Advisory Committee. I have collaborated on all the policies and procedures that the DCSAA schools currently follow. I have also worked closely with the DC Public Charter School Board to help get athletic trainer into all the public charter schools. Hopefully by the new fiscal year this will be a reality. 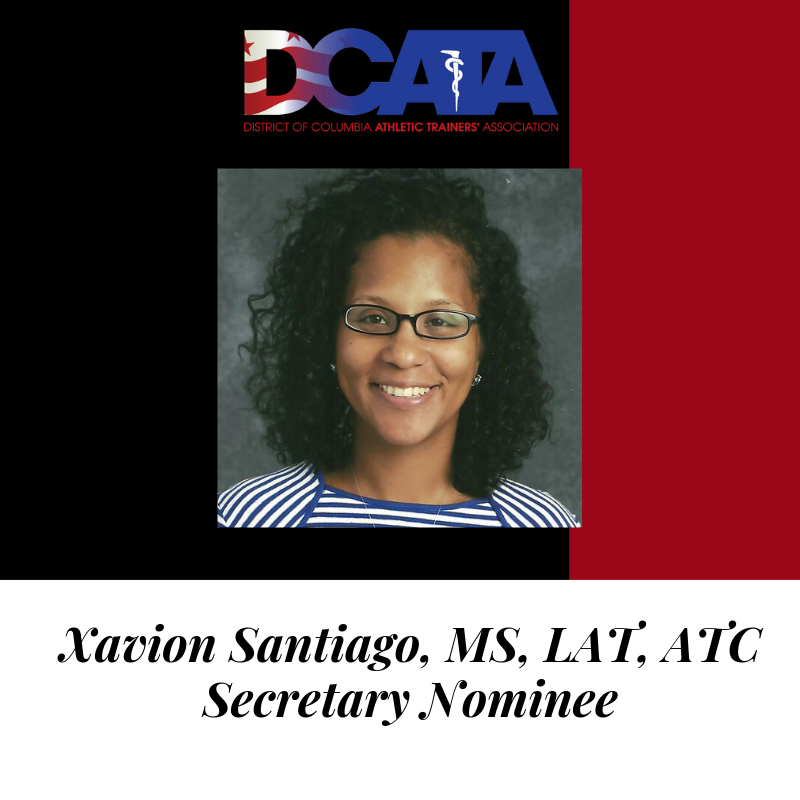 In 2016, DCATA applied for the NATA EDAC grant to help improve ethnic diversity within the field of athletic training. The grant allowed me to create the annual DCATA Student Athletic Training Symposium. In 2017, I became the MAATA Public Relations Chair based on my work with DCATA. I currently maintain all of MAATA’s social media platforms, which include Twitter, Facebook & Instagram. I am the District 3 representative to the NATA Public Relations Committee and also work on several other subcommittees and workgroups. I currently live in Alexandria, VA with my husband and four year old daughter. I am a 2007 graduate of the illustrious Temple University athletic training program. From there I interned for Michigan State University. I earned my graduate degree in Sports Studies from High Point University in 2010. Upon graduation I returned home to Maryland and accepted the athletic trainer position at St. Mary's Ryken High School. I have also worked as an athletic trainer for Charles County Public Schools and the College of Southern Maryland. I am currently the athletic trainer for The School Without Walls Senior High School in Northwest, DC. I reside in Maryland with my loving husband and 3 beautiful children, 4 turtles, 2 fish and a dog. I love promoting our profession, and particularly enjoy community service and with the youth interested in our field. 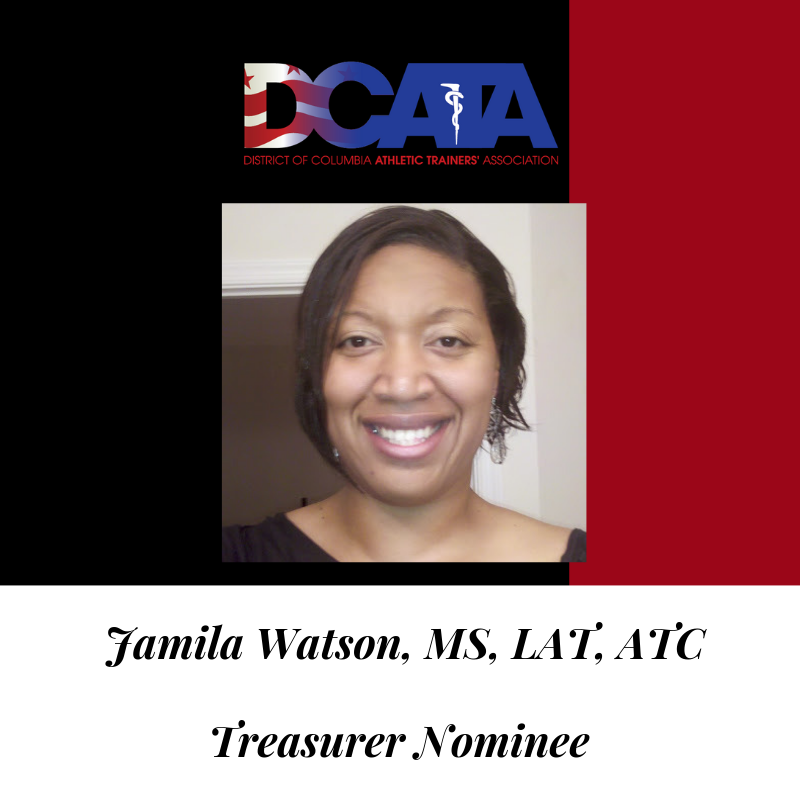 I am Jamila Watson and the current DCATA treasurer. I am a native Washingtonian, current DC resident and Lead Athletic Trainer (AT) for the District of Columbia Interscholastic Athletics Association (DCIAA), District of Columbia Public Schools (DCPS) system/Athletic Trainer for Woodrow Wilson HS. As the Lead Athletic Trainer, I oversee all aspects of the Sports Medicine Program. I am the liaison for the staff Athletic Trainers and am responsible for the medical care provided to and the safety of the DCIAA student athletes as it relates to policies, procedures, and venues. I am a product of DC Public Schools and possess a Bachelor’s of Science degree in Biology/Pre-Medicine from Spelman College, Atlanta, GA and a Master’s of Science degree in Exercise Science from The George Washington University, Washington, DC. I am a certified and licensed AT and an active member in the NATA, MAATA, and DCATA. I am also the DCATA Ethnic Diversity Advisory Committee (EDAC) Representative. I enjoy serving as the DCATA treasurer.